Health professionals and consumers are advised that Abbott Diabetes Care, after consultation with the TGA, has initiated a recall for product correction for its FreeStyle InsuLinx Blood Glucose Meter. 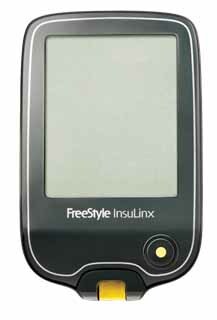 FreeStyle InsuLinx Blood Glucose Meters are primarily used for self-testing by patients with diabetes. It has been found that, at extremely high blood glucose levels (56.8 mmol/L and above), the device will display and store in memory an inaccurate low result that is 56.8 mmol/L below the genuine result. For example, for a blood glucose result of 59.1 mmol/L, the meter will display and store a result of 2.3 mmol/L (59.1 mmol/L - 56.8 mmol/L = 2.3 mmol/L). The likelihood of experiencing blood glucose levels of 56.8 mmol/L and above is remote. However, such levels pose a serious health risk to the patient and require immediate medical attention. If the identified fault occurs, there is a risk that diagnosis and treatment of high blood glucose levels may be delayed, or it could result in incorrect treatment. Abbott Diabetes Care is providing a software update for the meter, which will correct this fault. See 'Information for consumers' below for further information about the software update. Please note that this recall action only applies to FreeStyle InsuLinx meters. FreeStyle Lite, FreeStyle Freedom Lite, FreeStyle Optium and any other non-InsuLinx FreeStyle-branded meters are not affected by this issue. Abbott Diabetes Care is also writing to all patients who have registered a FreeStyle InsuLinx Blood Glucose Meter for warranty. If you have a FreeStyle InsuLinx Blood Glucose Meter, visit Abbott Diabetes Care's webpage and follow the step-by-step instructions to update the software of your meter. The update will correct the fault and maintain your meter's settings and historical data, including any insulin calculator settings. You can continue to test your blood glucose level with your FreeStyle InsuLinx Blood Glucose Meter until you update the software. However, if you experience symptoms that are not consistent with your readings, you should contact your diabetes nurse educator or other health professional for treatment advice. If you have any problems or questions regarding the software update, please call Abbott Diabetes Care's customer service line on 1800 639 505 between 8am and 5pm (AEST), Monday to Friday. If you have any general questions or concerns about blood glucose meters, please contact your diabetes nurse educator or other health professional. Abbott Diabetes Care is writing to all health professionals whom it has on record as being supplied FreeStyle InsuLinx Blood Glucose Monitoring Kits, providing further information regarding this recall action. If you have FreeStyle InsuLinx Blood Glucose Monitoring Kits, please stop supplying them to patients. Contact Abbott Diabetes Care's customer service line on 1800 639 505 between 8am and 5pm (AEST), Monday to Friday, for further information. Consumers and health professionals are encouraged to report problems with medical devices. For more information see the TGA Incident Reporting and Investigation Scheme (IRIS).